Hazel Jane’s Wine & Coffee is designed to be an everyday hangout—for downing a cup of joe, grabbing a quick lunch or weekend brunch, or lingering over small plates and a bottle of wine in the evening. 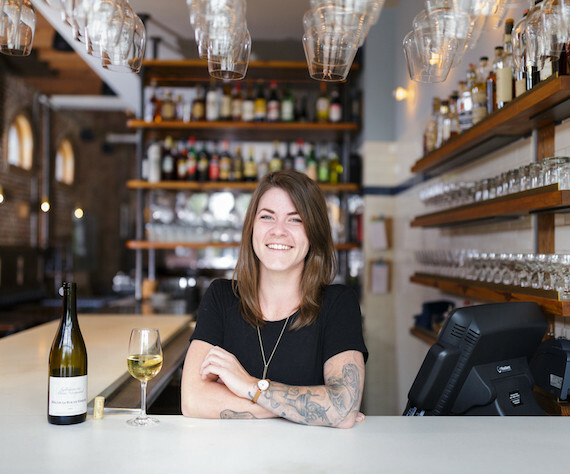 “The idea is to have an approachable, cozy space for the neighborhood, in a beautiful environment with super laid-back people who love and care about wine,” says beverage director and general manager Melissa Davis, formerly a sommelier at Staplehouse. “We’re trying to make it as uncomplicated as possible,” she says. Hazel Jane’s will have about 150 bottles and serve 10 by the glass. There will be a small retail area where those, as well as other varieties, are sold to-go. The wine will not focus on any one region. “Incredible wine is made all over the world. I want people to try the wine from places you wouldn’t imagine, like New York, Canada, England, and Virginia,” Davis says. Spirits, including vermouth and amaro, will also be available. For those who don’t drink wine, a couple of beers will be offered. Since Hazel Jane’s is backed by Revelator, coffee will be available all day. However, the offerings will be limited to the classics, including drip, espresso, and iced. Andrea Kirshtein, formerly of Empire State South, will provide breakfast pastries, prepared in a commissary kitchen. Kirshtein will make all of the bread for Hazel Jane’s. Located in the Edge complex (670 DeKalb Avenue) next to Kevin Gillespie’s Cold Beer, Hazel Jane’s was named after the first female pilot in Georgia, Hazel Jane Raines. Why? “Because the original address of the space was Airline Drive,” Davis explains.